Quotes and Messages for Someone Who Has Hurt You is another collection to help you reflect the feeling of being hurt by the person you really love. We love with all our heart and we wish to be loved in return. But what if that person doesn't feel the same way? What if after all of the things you've done, he/she still chose to break you heart? Most of us gave their best to be that someone who's always-there-whenever-you-need-me but has been taken for granted whenever they need someone to be there for them. It seems life is unfair but we can't blame people if they can't love us back. It really hurts and we have to accept the fact things can't go on the way you want them to be. After all, we should never forget to love ourselves first and that is the love that we truly deserve. Everything comes and go and we should have something left for us so we could start over again especially when people leave with our hearts broken. If you're looking for the right words to say to him/her then this read is for you. Here's a selection that you can relate for sure. Sana hindi na lang kita nakilala..
Masaya naman ako noon eh, kahit nung wala ka pa! Di tulad ngayon.. Pinapahirapan mo lang ako..
Alam kong hindi mo sinasadyang makilala ako..
Ako rin eh, Hindi ko sinasadyang mahalin ka!" Ngayon naranasan ko na paano masaktan..
Pag nalaman mo na may nasaktan ka?" laro o totoo, isa lang alam ko... MAHAL KITA masaktan man ako!" Hindi mo ito maririnig dahil iba na mundo mo!" Bakit kaya sobrang hirap ng totoong love na ang ino-ofer mo? "Love naman kita eh, Friends tayo di ba?" "Marami akong hindi masabi ..
Babalik ako para sayo at sasabihin ko na..
Pinahalagahan kita ng sobra kahit hindi mo nadama!" Kailangan syang mawala para matuto kang maghanap." Quotes to ponder? 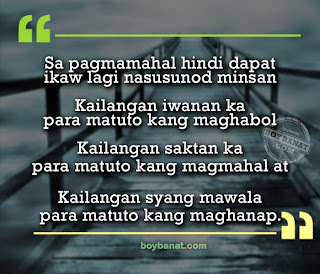 Make your day by visiting www.boybanat.com and browse our wide collections. You can also submit your own compilation to us and will be glad to have it featured here. 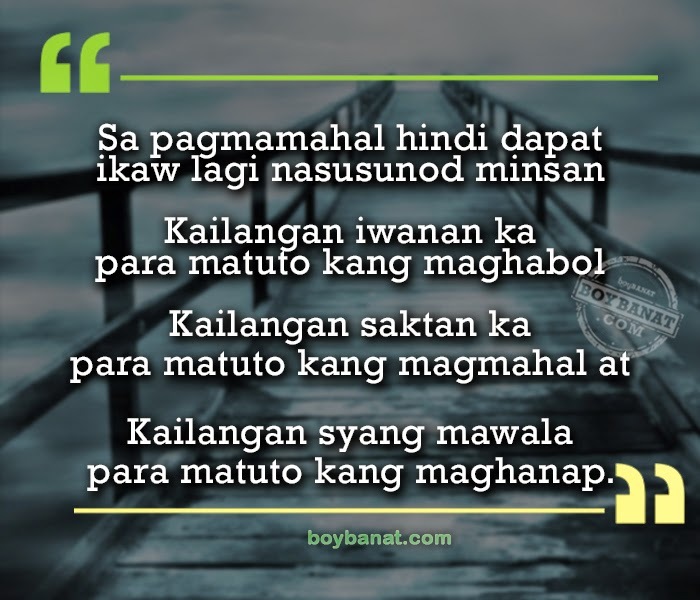 Feel free to messages us at Boy Banat Official Facebook page.